Autoclaving is badly suited for the sustained removal of nucleic acids. DNA molecules in recombinant microorganisms are merely fragmented in the autoclave and subsequently released with the vapours when opening. 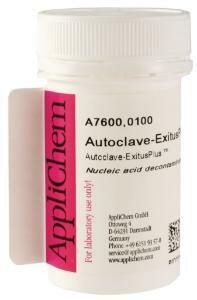 By adding Autoclave-ExitusPlus™ to residual cultures or buffer solutions, the nucleic acids are effectively destroyed during autoclaving.